But despite complaining to the City of Rockingham and the local residents’ association about the road’s inadequacy, he says nothing is ever done to improve the situation. He says its well past time the road was expanded to double lanes. The single-lane road is the only direct entry and exit to the booming coastal suburb from Mandurah Road, and with a population of about 3000 expected to increase to more than 4000 by 2021, the congestion will worsen. Mr Wiggins said the road was subject to traffic jams most days, especially at peak hours near bus stops and shop access ways, and on Saturday mornings when rubbish trucks were making collections. He said the road’s use had recently increased with the new Ocean Crest subdivision adding another access street for about 100 homes. ‘There are nine trees on the road and they all have scars from car accidents. I’m surprised someone has not already been killed on this road where there is also the crest of a hill that can be even worse at sunset, ‘ Mr Wiggins said. ‘At school times cars are backed up half a mile to Mandurah Road. 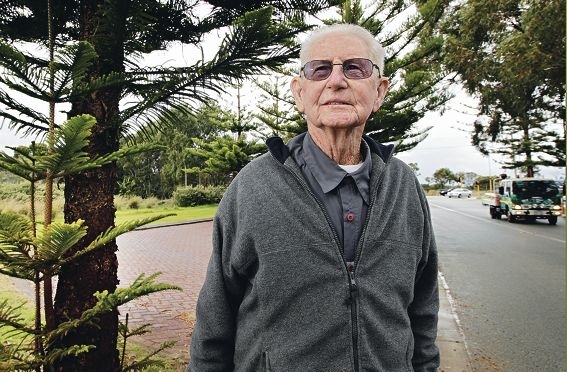 The kerbs have no cat’s eyes and are stained with bore water making them difficult to see at night.’ Singleton Residents’ Association President Margaret Tysoe agreed it was a matter of time before there was a major incident or fatality on Singleton Beach Road. ‘We understand the City of Rockingham takes advice from the experts, but they don’t seem to listen to the ratepayers who use the amenities and infrastructure,’ she said. City of Rockingham Mayor Barry Sammels said the council did not believe the road was inadequate, but there was a proposal to upgrade the traffic signal-controlled intersection at Mandurah Road as part of the West Karnup development. Mr Sammels said it would cost about $1.2 million, likely to be sourced from rates, to upgrade the road to a dual carriageway between Mandurah Road and Federation Drive. He said 2010 traffic counts recorded an average 4000 vehicles a day, but Main Roads’ recommended maximum volume for the road was 6000 vehicles a day. ‘Dual carriageways are generally not needed until volumes reach over 16000vpd. Modelling by a traffic consultant suggests the traffic queue lengths on the road in the 2021 would be a maximum of 76m which is a fraction of the 800m queues being claimed,’ Cr Sammels said.